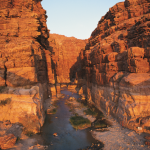 Wadi Mujib Reserve is the lowest nature reserve in the world, located deep within the Wadi Mujib gorge, which enters the Dead Sea at 410 m below sea level. The reserve extends to Madaba in the north and Karak in the south, reaching 900 m above sea level in places. This 1300 m change in elevation, combined with the valley’s year round water supply means that Wadi Mujib enjoys a magnificent biodiversity that nature fans will love. 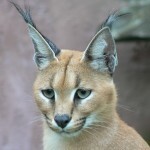 Over 300 species of plants – some of which are considered rare, 10 species of carnivores such as the Syrian wolf, Caracal (mountain cat), and the very rare Arabian leopard. Plus numerous species of resident and migratory birds have been recorded. 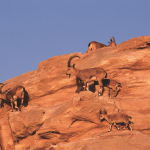 Some of the mountain areas are difficult to reach and offer safe havens for the endangered Ibex a species of mountain goat that was nearly wiped out due to over hunting. 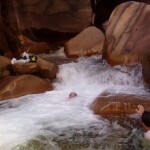 Wadi Mujib is also great place for thrill seekers, the hills and valleys that lead down to the Dead Sea provide a natural playground for a wide range of outdoor activities such as hiking, climbing, and canyoning. 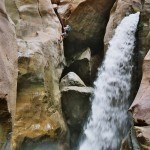 There are several trails starting from the visitors centre, some are easy self guided short walks, while others are for the more adventurous – guided trails with rope assisted climbs and abseils down waterfalls that can take up to 7 hours. So grab a life jacket and take the plunge! 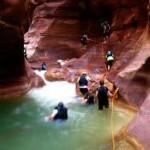 The river is your only path as you walk, swim and climb up from the Dead Sea through the narrow, high walled canyons. Alternative is to stay at the Dead Sea, or depending on where your trail starts maybe Madaba or Karak.